(Nanowerk News) Even though vitamins play a central role in biology, their gas phase physical properties are still less well studied. The potential of quantum-based methods in biomolecular studies, has now been explored at the University of Vienna ("Quantum-Assisted Metrology of Neutral Vitamins in the Gas Phase"). 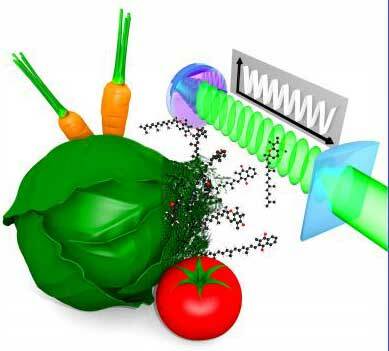 For that purpose, Lukas Mairhofer, Sandra Eibenberger and colleagues in the research group around Markus Arndt at the University of Vienna, prepared molecular beams of (pro) vitamins A, E und K1, that is β-Carotin, α-Tocopherol und Phylloquinon. These molecules fly then in high vacuum through an arrangement of three nanogratings. The first grating forces every molecule through one of about a thousand slits, each of them only 110 nanometers wide. According to Heisenberg's uncertainty principle, this constriction of the molecular position entails an indeterminacy of the molecular direction of flight -- the molecule is spatially "delocalized". This prepares the motional state of every single molecule such that it becomes impossible, even in principle, to follow the molecule's path through the experiment. The second grating is realized with a green high-power laser beam that is retro-reflected at a mirror inside the vacuum. A standing light wave is formed, i.e. a periodic array of regions of high and low light intensity. When they arrive at this second grating every molecule is already delocalized such that their wave functions covers several bright and dark regions -- even though these are more than hundred times further separated than the size of each molecule. Within the bright and dark zones, the molecules are more or less accelerated. This modulates the extended quantum wave front. Since the molecules do not follow a well-defined path but rather a superposition of possible paths through the machine, an interference pattern emerges: this is a periodic distribution of probabilities to find a molecule at a given location. This pattern is then compared with the third grating, which is a copy of the first silicon nitride grating. The ultra-fine structured interference pattern is used as a quantum ruler to read out nanometric deflections of the molecular beam, which are hard to measure by established methods. The modulation and position of the interference pattern then allows extracting information about the interaction of the biomolecules with external fields. This includes the interaction with the diffracting laser beam as well as with a controlled electric field that shifts the molecular density pattern. The researchers use this to determine electronic and optical properties of biologically relevant molecules, here the (pro)vitamins A, E und K1. Pro-vitamin A, for example, plays an important role in photosynthesis. Lukas Mairhofer, the lead author of this study, is happy: "We have a universal tool for improved measurements of biomolecular properties". The experimental results were compared with simulations. For that purpose, classical molecular dynamics simulations describe the time evolution of the molecular structure and are combined with density functional theory to assess the electronic properties. This results in a good agreement between experiment and theory. The combination of molecule interferometry and quantum chemistry serves as an example for the successful collaboration at the interface between quantum optics and physical chemistry.